1978 GL1000 Resto-mod - Page 3 - NGWClub®, Inc.
Why is it that brakes are always such a PITA? When I was rebuilding the Yamaha, I tried more methods than I can count to fix leaking calipers. I finally broke down and found replacement calipers on E-Bay. I tried to circumvent that whole process on this build. Oh, the RH slave cylinder is cracked and leaking? I won't even attempt a repair -- I'll jump straight to "replace it." 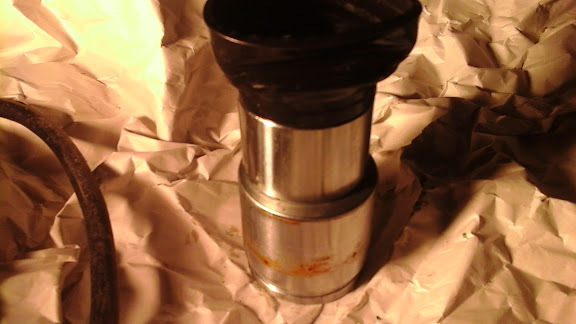 Except what I received was a LH slave cylinder on a RH bracket, grrr. Fine. I'm having problems with the fittings leaking on the LH slave cylinder, so I'll move the LH that's mounted on the right side to the left bracket, and order another RH caliper from E-Bay. 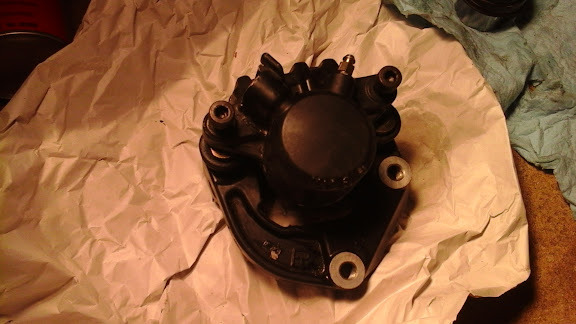 However, the "1978 GL1000" brake caliper I received, isn't. It's very similar, which has me wondering if it's from a GL1100, maybe, but the bore of the cylinder is bigger than that of my old GL1000 cylinder. Rebuilding isn't a problem -- I've rebuilt all of the calipers I've tried. The problem is a crack inside the cylinder wall on one, and a leak around the bleeder valve (from the threads, it looks like) on another. About the only way to fix them, as far as I can tell, is to weld them. The one with the leaking bleeder *might* be repairable by replacing the bleeder with a plain 8mm bolt and crush gaskets, but I'd really prefer to have a brake that I can bleed properly. rcmatt, thanks, I wasn't aware of that. I knew the '76 and '77 models were different than the '78, but I didn't know the '79 was, too. I'll keep that in mind while searching for a brake that works. In the mean time, I'm gathering up quite a collection of miscellaneous, old bike parts! mwallette wrote: rcmatt, thanks, I wasn't aware of that. I knew the '76 and '77 models were different than the '78, but I didn't know the '79 was, too. I'll keep that in mind while searching for a brake that works. In the mean time, I'm gathering up quite a collection of miscellaneous, old bike parts! True......but "stuff" can gang up on "space"
More "stacks of stuff" on the way. I could only find a lh/rh pair of '78 GL1000 brakes on E-Bay. Thought I might be able to score just a RH brake from the brother of a friend, but the ice on the roads up here in Alaska is melting quickly and I want to ride as soon as my driveway is clear*. Once the brakes get here, I'll disassemble, clean and rebuild...again. *In other words, I got impatient, lol. On a more positive note, I managed to come across enough funds -- and spousal approval, lol -- to pick up the new shocks I wanted. Hagon 2810 TTSA's on the way! Should make for a nice 2-up ride. As cliched as it sounds, I've decided to mostly black out the bike, so on my to-do list: remove the crash bars, passenger grab rails, fenders, and clutch lever, clean them, and paint them with either black roll bar paint or the Dupli-color Blackout Shadow paint that I used on my XS750 tank. The plastic shelter covers and side covers will also come off, get sanded down to bare plastic, have the Honda and GL1000 emblems removed, and be painted satin black. I've got a spare set of wheels, so I most likely won't touch the wheels already on the bike, but will probably paint the spares in the future. I'll have to do something with the mirrors, too. Aesthetically, they don't work, and, since they are pretty much the same as the mirrors on my wife's CB750, I'm not optimistic about them functionally, either. I'm the road captain in the group I ride with, so being able to see what's happening behind me is important (the only reason I didn't go with bar-end mirrors, like I did on my XS750). I've got a couple of ideas in mind, but...later. Let's get it running, first. One other question for the gurus: when I first started the bike, after it had been sitting for a year (-ish -- I don't know how long, exactly), there were a few drips from the water pump. The last two times...nothing. Is that "normal" or should I proceed with my plans to replace water pump gaskets? Was it just lack of use, or is this a warning that I should address before it really becomes a problem? I've had the water pump weep hole drip a bit after sitting over the winter. Other's too I believe. Rather normal as long as it stops. robin1731 wrote: I've had the water pump weep hole drip a bit after sitting over the winter. Other's too I believe. Rather normal as long as it stops. Okay, I'll keep an eye on it for a while before tearing into the pump. Thanks! rcmatt, ROFL! They aren't leaking; they're marking their territory!